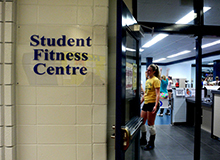 Loyalist College’s Fitness Center welcomed back the ladies with a night of their own. Between the hours of 6 and 9 p.m. on Wednesdays, women take over the free workout facility — no men allowed. Cory Metsre, fitness center coordinator, created the ‘ladies only’ theme last year, after being approached by the Loyalist College Student Government. The request came from students with self-confidence issues, he said. Wanting to create a sense of community among students at the college who were trying to get healthy, Mestre opened the doors to project “Ladies Night” last March. The results showed low numbers that just kept getting lower every week. Convinced that the turnout was lousy because it was the time of year students are usually focused on exam finals or are away at program placement, Mestre said the attempt deserved another shot. “The second attempt focused on the beginning of the year, to avoid clashing with students schedules,” said Mestre. Having the second “Ladies Night” for the month of September last night, numbers are confirming to be consistent. “I am very pleased. Our first week we had 24 ladies, and last night 25 turned up,” said Mestre. The numbers are staying the same, but that could be with the help of the women’s volleyball team. A number of those in attendance appeared to be members of the team. Kristen Curtis, a second year Police Foundations student and volleyball team member, said the idea of “Ladies Night” is a step in the right direction towards women working out and feeling free of judgement. “The girls from the volleyball team usually work out here [the fitness center] Wednesday nights before our practice, and having the feeling of similar goals from various students makes them easier to achieve,” said Curtis. Starting at 6 p.m., women are free to use any and all machines without sharing them with males. Dominic Jones, the fitness manager from a women’s only Good Life Fitness in Kingston, said the atmosphere involving only women really is different. Similar to Loyalist’s fitness center, Jones’ facility is a smaller gym, allowing a more intimate exercising experience. “Feeling comfortable being surrounded by people at the same workout level as you will almost always put a positive spin on the experience of fitness,” said Jones. Mestre said he is really trying to make a sense of community by installing the ladies themed night is for people, regardless of gender, to confront their personal issues in order to stay healthy. “I focus my effort as the facility coordinator, into making this a welcoming and upbeat environment. This center will not tolerate any loud or obnoxious behaviour. Our goal is to maintain a safe place that people can feel positive about,” he said. If there is enough interest, Ladies Night is planned to continue every Wednesday. Mestre’s next step, after making the Loyalist ladies more involved in physical activity, is to hopefully create a “Beginners Night” for both genders to come out.